Oxford United owner Darryl Eales has called on U's fans to keep coming out in their droves and buy into the club's exciting potential. 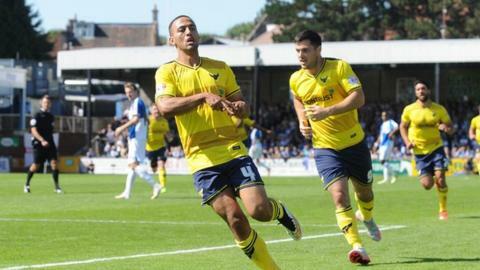 Oxford beat fierce rivals Swindon Town 2-0 at the Kassam Stadium on Tuesday. And Eales was delighted with the support his side received en-route to the third round of the Johnstone's Paint Trophy. "The crowd were absolutely unbelievable for 90 minutes and the boys responded," Eales told BBC Radio Oxford. Oxford played in front of their biggest home crowd of the season and Eales has paid tribute to the record 9,013 attendance. "The more people we can get to join the bandwagon, it makes a huge difference," he said. "Hopefully, for once, we can say big crowd, big performance, so come on back." Michael Appleton's side have started the season well and currently occupy a League Two play-off spot. The U's could go top with another home scalp over Wimbledon on Saturday. "Everything is going well at the moment, but we are going to get hiccups because it cannot always continue like this," Eales added.